She was a pupil of the Berlin vocal pedagogue Laura Détschy. In 1910 she made her debut at the Berlin Sommer-Oper as Elsa in ‘’Lohengrin’’. 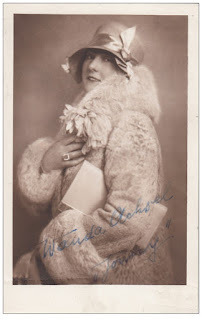 In the 1910-1912 seasons she was engaged by the Stadttheater in Würzburg, in the 1912-1923 seasons she sang at the Opernhaus of Cologne and from 1923 to 1939 at the Wien Staatsoper. Already during her engagement in Cologne she became a known soprano and appeared at the Cologne Opera among other things in the premières of the operas ‘’Königskinder’’ of Humperdinck, ‘’Die heilige Elisabeth’’ by F. Liszt and ’’Der Rosenkavalier’’ of Richard Strauss. At the Staatsoper in Wien she sang in 1923 the difficult title part in the première of the opera ‘’Fredegundis’’ of Franz Schmidt. She gave guest performances in Holland, Poland, Yugoslavia and in Czechoslovakia. At the Salzburg festival she guested in 1926 as Rosalinde in ‘’Fledermaus’’. Her repertoire included Cio-Cio-San in ‘’Madama Butterfly’’, Mimi in ‘’La Bohème’’, Desdemona in ‘’Otello’’, Elsa in ‘’Lohengrin’’, Elisabeth in ‘’Tannhäuser’’, Sieglinde in ‘’Walküre’’, Octavian in ’’Der Rosenkavalier’’, Marie in ‘’Wozzeck’’. In 1935 she performed at the Staatsoper in Wien in the premiere of ‘’Die Dame im Traum’’ by Franz Salmhofer, in 1937 at the same opera house in the première of B. Paumgartner’s opera Rossini in Neapel’’. Till 1933 she was married with tenor Hans Clemens (1890-1958), whom she had got to know during her Cologne engagement. After her retirement she taught singing in Vienna.